Promise Land is a Sunday School program committed to providing age-appropriate lessons relevant to today’s children. Activities are designed for children preschool age through 5th grade. All children are invited to attend, membership is not required. Promise Land meets at 10:15 am each Sunday during the school year, located in the multi-purpose room. 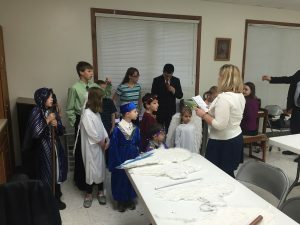 The group also shares the good news in a Christmas program and Easter program, where children can relive the experience in costume through readings and song. Students in 6th through 8th grade are invited to join the leadership team. This provides them the opportunity to learn the Word of God while sharing it with the younger children. Any questions may be directed to Renee Sang.